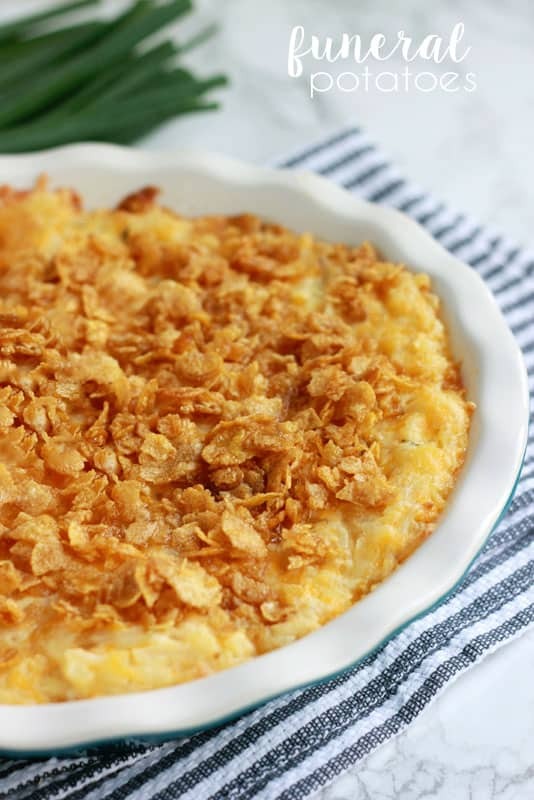 Swap up your sides this Thanksgiving with these cheesy Funeral Potatoes. 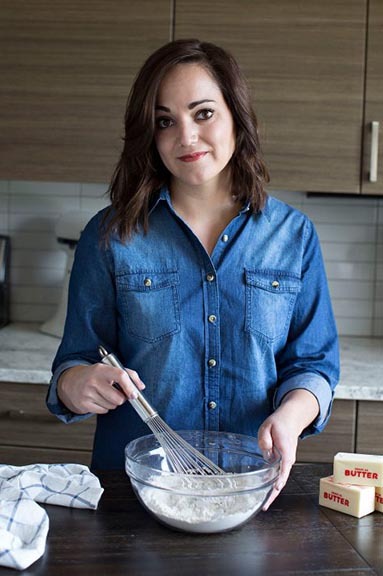 So, I admit that this isn’t your typical Thanksgiving recipe. It is a side dish you could enjoy all year long but this year it is making an appearance on our holiday table. Along with being a super simple recipe it’s also my six year old’s most requested dish. I’m sure it has something to do with the mountains of cheese and hash brown potatoes. It’s two of his favorite things combined into one. We frequently make this for pot lucks or large gatherings and end up coming home with an empty container. Be prepared to have everyone ask for the recipes! The original version of this was handed down from my mother in law. She would whip this up along side meatloaf and chicken for Sunday dinners and it is on the list of favorites from every single family member. 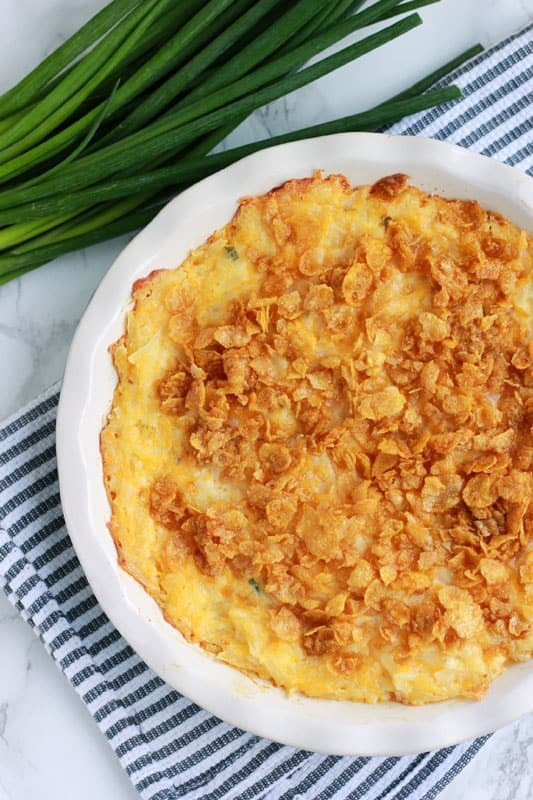 You start with a hash brown base (frozen variety or fresh), mix in a little sour cream and cheese, and top with a buttery cereal topping. The result is a gooey cheese filled casserole with a crunchy finish. Instead of yellow onions we like to use green for a slightly stronger flavor. This also makes for a great freezer meal. We are always whipping up a full batch and dividing it between two (or sometimes three) containers. One heads straight for the oven the other for the freezer. When you are in a dinner rut you can pull one out and stick it straight into the oven. I do suggest holding off on the cereal topping until you are ready to bake. It tends to get a little soggy when you freeze. In a large bowl combine all of the ingredients except the corn flakes. Stir until fully combined and spread into your prepared pan. Sprinkle the top with your cereal. Bake for 45 minutes or until cheese is bubbly. 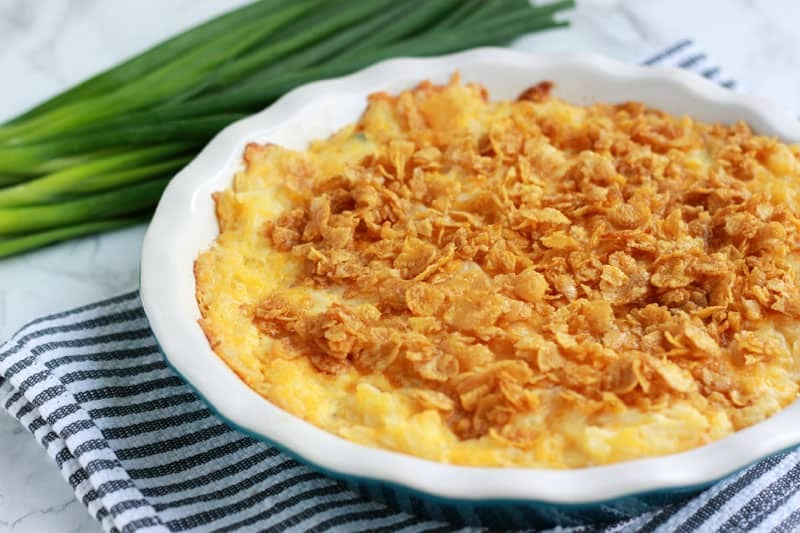 I LOVE funeral potatoes! They are SO good.. don’t make them nearly enough though 🙂 I need to fix that! so does dax! He said he can’t wait for his birthday so we can have them again. I think these would be great with cheddar cheese soup, LOTS AND LOTS AND MORE CHEESE. Smoothed out about an 1/2″ maybe a little more, Frozen solid, cut into 4 squares and then fried up in a buttery skillet till golden and severed with the eggs of your choice (over easy, please ). A well-known frozen potato company used to have something like that but Unfortunately stopped making them. Go figure! This sounds like it will make a wonderful substitute for that discontinued favorite. Sounds like something I should definitely try!